Length: 13 1/4" x Depth: 9" x Height: 7 1/2"
Black accents provide elegant detail to this walnut wooden jewelry box with locking top. 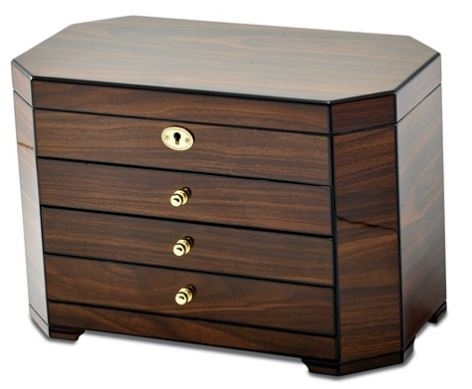 With a design to last over many generations, this exceptional walnut jewelry box also features a brass lock and key, angled corners, 3 pull out drawers, generous divided storage, 8 jewelry hooks with necklace pouch, and plenty of ring rolls for even the largest collection of rings and earrings. 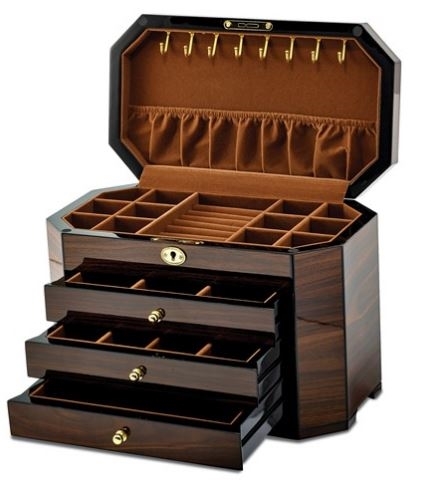 This luxury jewelry box is a wonderful storage solution for a collection of fine jewelry. Makes an amazing Holiday or Mother's Day gift!